How to have Fun with Children and Family Without Getting Wet! Fun for all . Will Spiderman Return? The event is intended for Rotarians, Friends of Rotarians and their family that have a sense of adventure. In order to make your event the best it can be, please ensure that if you are bringing young adults that ALL HAVE A SIGNED WAIVER WHEN THEY WALK INTO OUR FACILITY. I need to make sure that all parents of invited children receive the information contained in the waiver section below as it contains steps they must take in order for their child to be admitted into our facility. WAIVER: Every person entering Great Western Power Company (kids, parents, grandparents and hosts) must have filled out a waiver. Anyone under 18 must have their waiver filled out by their parent or legal guardian. To expedite the check-in process, have all parents fill out their child’s waiver online here: WAIVER. When filling out the online waiver, please be aware that it is a two-part process. Once you have completed the waiver, you will be required to confirm via an email that will be sent to the address you provide. THE WAIVER IS NOT COMPLETE UNTIL THE FINAL CONFIRMATION STEP HAS BEEN DONE.. CLOTHING: Children should wear loose-fitting, comfortable clothes and sneakers or tennis shoes. Children will be climbing in their own shoes. 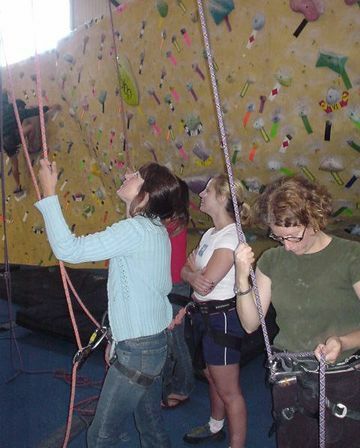 Climbing shoes may be rented for an additional $4/pair charge. FOOD: The facility has a small area. You are welcome to bring your own snacks or purchase them at the gym. We ask that you keep food and beverages off the blue carpets. PARKING: There is not a private parking lot. All parking is on the street, please allow 15 minutes or more to park your car. Do not hesitate to call Great Western Power Company or myself if you have questions or need more information. Tipping the instructors is welcome but never required.